24 May: Redang for the rich & famous? As more reports on the extent of coral damage resulting from this year's mass bleaching event continue to trickle in, the picture painted so far has not been pretty. In one of the latest reports, the Wildlife Conservation Society (WCS) noted that up to 60% of corals off Aceh in Sumatra, Indonesia, had suffered bleaching. The more disturbing fact was that the rate and extent of coral mortality exceeded that of other recorded	bleaching events, leaving 80 percent of some species dead and more colonies expected to die within the next few months. Some of these corals had survived the 2004 Indian Ocean tsunami but succumbed	to record temperatures that rose up to 4 degrees higher than the long term average. According to NOAA, the average temperature for Jan-July 2010 was the warmest on record, with July 2010 being the second warmest July on record after July 1998. Bleached hard and soft coral at Tioman. 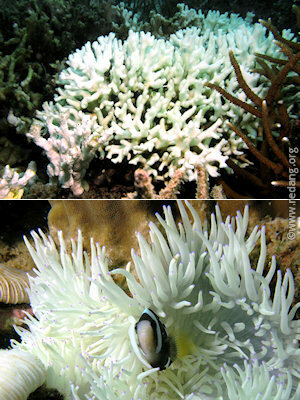 While diving in Tioman at the end of July, I noticed many patches of bleached coral especially in the shallower areas. Compared to what I had seen in Redang in 1998, this seemed far worse as more species of corals were bleached. These included hard corals like staghorns, lettuce and the slow-growing brain and ridge corals and also soft corals like anemones. While corals can adapt to warmer oceans, for example, those in the Red Sea seem to thrive even though ocean temperatures there are warmer compared to other regions, it remains to be seen if corals can adapt to the higher-than-normal rate of increase of average ocean temperatures we have been seeing in recent years. One solution that promises some hope is to partner the coral polyps with specific species of algae that are more heat-resistant. Perhaps such bleaching events may be natures way of allowing such algal species to proliferate and partner naturally with coral polyps. Only time will tell. In the meantime, some of you have had questions about the extent of closures of snorkelling and diving sites in Redang and whether you should continue with your plans to visit. From what we know, only a few sites are affected. Most of the snorkelling and dive sites are still open to visitors. So there's no need to cancel if you have booked or planned your trip, just remember to be responsible visitors when you're there. My return to Tioman after 13 years was a memorable one. After all, it was Tioman that stirred the passion within me for marine life which led to this website. It was also my first time diving Tioman. The place was still full of urchins just like it was back in 1997 but the few dive sites we visited showed that underwater, Tioman still had plenty to offer, certainly enough to warrant future visits. We experienced warm hospitality at Berjaya Tioman where we stayed and also visited TAT Turtle Sanctuary where we helped release green turtle hatchlings back to the sea. You can read all about it in the Tioman 2010 trip diary. Earlier this year, El Nino gave the region a blisteringly hot start to 2010 and we wondered if the coral reefs would experience widespread bleaching. A GCRA announcment in May predicted that 2010 might turn out to be the worst coral bleaching event ever. Then we heard reports from Maldives suffering their worst ever coral bleaching since 1998, followed by reports of bleaching in Phuket, the Andaman Sea and the Great Barrier Reef. Though I have not gone diving yet this year to see for myself,	it looks like the reefs in Malaysia haven't been spared. Two articles in today's Star Online reported that some popular dive sites in Redang, Tioman, Tenggol and Payar islands have been closed to divers and snorkellers from now until end-October. This effectively makes these sites in Redang off-limits till next year since visiting season in Redang ends on 31 October. It's a good move as this will hopefully give the affected corals	time to recover. This battle with rising sea temperatures and ocean acidification is the biggest threat to survival for coral reefs all over the world and has been played out repeatedly over the last few decades, sometimes resulting in severe coral losses. Limiting human activity can only help to lessen the stress faced by these reefs. It is a strong reminder to us of the fragility of coral reefs which are sensitive to ocean temperatures where a slight rise of 2 degrees is sufficient to cause bleaching, where the corals turn white after ejecting the algae that lives in symbiosis with the coral animal polyps. A prolonged situation like this will eventually cause the corals to die. Bleached corals can recover, but they need our help and one way is to limit and reduce the threats from human visitors and human activities. So we appeal to visitors to Redang and other islands to be supportive of this move by the authorities. While we enjoy seeing the beauty of the coral reef, we should cooperate with resorts and applaud them when they choose not to bring visitors to certain snorkelling or dive sites which are already suffering greatly. We can also do our part by being responsible visitors when we visit by not littering and to behave in an environmentally responsible manner. Hopefully, the cooling effects of La Nina will also help these reefs by bringing down ocean temperatures. The current prediction is that La Nina will take us through the second half 2010 to next year. Already, in Singapore we appear to be seeing one of the effects of La Nina: heavier-than-normal rainfall which had caused the recent bouts of flooding. Boxfish and seahorse	at Siam Ocean World, Bangkok. While on holiday in Bangkok recently with the family, I spent some time alone resting at the Siam Ocean World at Siam Paragon	Shopping Center. Yes, resting. Bangkok is not a place for people like me who don't have sturdy shopping legs. If you don't believe me, try covering the humongous Jatuchak flea market, MBK and the Siam trilogy of shopping centres	at Sukhumvit and an evening at Suan Lum night bazaar. It is the equivalent of an ironman shopping triathlon and probably feels like finning from Redang to Perhentian! Good thing I didn't have Central to cover as well, thanks to the recent unrest in Bangkok, though the women folk probably missed it terribly. Anyway, back to Ocean World. I almost gave it a miss when I saw the 900B (S$40) entrance fee. Though it's the biggest aquarium in Southeast Asia, it's even more expensive than Okinawa's Churaumi aquarium and about the same as Monterey Bay Aquarium. Certainly not Thai-priced like food and other shopping items. Good thing I had a BTS Skytrain tourist map with a 20% discount coupon. The place was quite well designed with lots of places to just sit down, rest my weary legs and gaze at swimming fishes. It was also a good opportunity to take photos of captive marine life who can't hide from photographers. The aquarium offered glass-bottom boat tours as well as a walk with the fishes wearing a dive helmet. Overall, I expected more for the price but still a good place to rest your legs if you're tired from shopping. Just make sure you have those discount coupons handy. 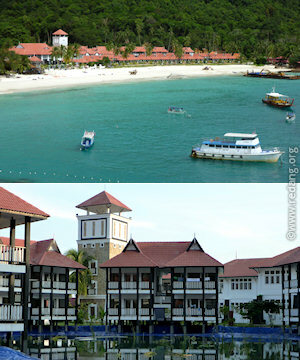 If all goes as planned, I'll be visiting Tioman this weekend for a short dive getaway. It'll be my first time diving Tioman and my first time back since my only visit in 1997. This will be a prelude to a planned Bali trip at end of September where I hope to see the enormous Mola-Mola or sunfish. As for Redang, I've no personal updates as I have yet to visit this year. Those looking for more info may want to check the Forums for updates from other visitors. 24 May 2010: Redang for the rich & famous? Early last month, an article in the local Malaysian papers mentioned that in future, Redang would be turned into a getaway exclusively for the rich and famous, with only hotels rated five-star and above allowed to be built. According to that article, the Terengganu chief minister said that "in future, only wealthy individuals would be able to afford holidays in Pulau Redang as hotel rooms will cost no less than US$500 (RM1,599) a night." Apparently, the reason was that this was "the only way to save the surrounding rich marine life and prevent environmental destruction due to pollution and indiscriminate littering." I applaud the objective. In fact, such a call to action to protect the marine environment in Redang is long overdue. However, I disagree that this is the only way to do so. If, as the article suggests, that some of the budget resorts are discharging waste into the sea, then the problem is one of enforcement, or lack of it. Resorts that fail to meet these operating procedures for sewage disposal should be warned or fined and made to abide by these regulations before their operating licenses are restored. There would be no need to penalise all the lower-end resorts (I'm sure not all are guilty). Another way is simply to tighten the regulations and set higher environmental standards for all resorts to meet. If this is not practical, another way is for the authorities to build a common sewage disposal plant that meets strict environmental standards for use by all resorts and charge them a monthly or annual fee to cover the costs. There is no need to allow only 5-star resorts to be built to address this problem. This is like saying only expensive Mercedes, BMWs, Jaguars and Lexus should be allowed on Malaysian roads because some small, compact cars have been found to pollute the air too much. Of course, this is absurd (not to mention it'll hurt Proton too!). The car industry enforces that all cars meet stringent emission standards, regardless of whether they are compact or luxury cars. The same can be done for resorts in Redang. If the problem is one of having too many visitors, it should be simple enough to control the number of rooms on the island to control the visitor population. Alternatively, it may be as simple as allowing only a certain number of visitors each day with visitors buying some kind of Marine Park daily permit for each day they stay on the island (or resorts factoring this into the package price). Once all permits are taken up for that day, no one else is allowed to visit. This is similar to what the Sabah state government has done with Sipadan. A good method that does not discriminate between visitors based on their levels of affluence. Finally, if the problem is one of irresponsible visitors littering or trampling on corals, then this again is a problem of enforcement and also one of education, not whether the visitors are rich or poor. There are already marine park regulation signs all over to inform visitors of the penalties if they flout park rules. Just that it's not clear who's enforcing them. Are resorts empowered to enforce, and if so, would they do so at the risk of offending their guests? I know of dive centres in Sabah that will not hesitate to ban divers from the next few dives if they flout regulations. The beauty of nature is a gift from God for all of creation to enjoy. Redang is a beautiful island and one that should be enjoyed by all, not just the rich and famous. I have not had the opportunity to visit Redang yet this year, so my apologies for being slow on updates. Thanks to Eric at Pelangi for informing me that Ayu Mayang is now under Pelangi management. Those planning to stay at Ayu Mayang should contact Pelangi resort for reservations. Also, the dive centre at Ayu Mayang no longer exists so divers will use Pelangi's dive centre next door instead. Thanks also to Azamin who wrote in the forum to inform us that Wisana is undergoing some major renovation works to convert it to a boutique resort with a capacity of about 50 guests. It is expected to reopen in June 2010 but will not be open to individual or walk-in customers. It will only cater to exclusive corporate-type bookings for the entire resort. Azamin can be contacted at +603-27709988 if you have enquiries. Finally, thanks to islandboy_jeff who wrote in the forum to inform us that Mozana has closed for 2010. That would make Redang Kalong the only resort operating on that stretch of Kalong beach. 2010 visiting season took off towards the end of February to a blisteringly hot start! The hot spell in the region started around the first day of the Chinese Lunar New Year of the Tiger and scientists attributed it to another round of El Nino. Now that it has subsided, thanks to the recent wet weather, hopefully we won't see temperatures rising again too soon. It just brought back memories of the 1999 El Nino which wiped out quite a lot of coral reefs in this and other parts of the world. Let's hope it won't be so severe this time round. I had meant to update the site when season reopened this year but heavy work commitments since just before Christmas till recently had kept me busy, even away from the Forum. This was compounded by personal difficulties over the last year which had kept me largely preoccupied. Fortunately, monsoon season also meant fewer discussions going on in the forum pages. Still, my apologies to those whose questions in the forum went unanswered for some time. Aside from information updates to the various sections, I took the opportunity early this year to perform a long overdue upgrade to the Forum, which now runs phpBB 3.0.6. Previous registered forum users logging in will find many new improved features and customization options, though at the expense of some changes in the user interface. I've enabled image support so users can post photos using the '[img]' tag, though for space reasons, I've limited each photo to 128 KBytes. There	are some limitations for newly registered users, but these will be lifted once they've made a certain number of posts. The Google maps on this site have also been updated with the latest information and enhanced with HTML links to	appropriate site pages and forum discussions for simpler navigation. I managed to make two trips to Redang towards the end of 2009 season. The first was a dive trip together with Jules and Tango, our forum moderators, where we had the opportunity to fly Firefly from KT back to Singapore. Their	ATR-72 aircraft was new and though a turboprop, was quieter than expected. The total journey from Merang to my home in Singapore took just 3 hours, making it a quick and affordable way to travel. The second trip followed a week later and	was a family trip with some friends. It had been 3 years since our last family trip in 2006 and we really enjoyed the time spent together. The biggest change at Redang this year is the opening of	Sari Pacifica Hotel, Resort & Spa, Redang, formerly known as Desagreen Redang. Their opening had been somewhat of a mystery as it remained at different stages of completion over the last two years, even appearing to have been abandoned at one stage. As part of their opening promotions, they are offering hefty discounts on their villas from March to May starting around RM758 for a 3D/2N package. Their 74 luxuriously-appointed villas are obviously targetting the high-end visitors and in terms of their regular price competes more with Berjaya's suites. I hope to have more updates on this new resort soon. It seems that the rivermouth in Merang is facing siltation problems again after the monsoon, making it too shallow to be used by the bigger boats such as those operated by Laguna. As such, Laguna ferries are making use of KT Shahbandar jetty until the problem is resolved. Guests should check with Laguna and ensure they head for the correct jetty. 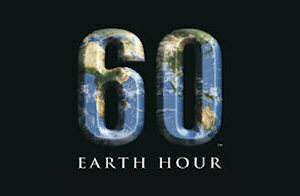 It's going to be Earth Hour again this Saturday 27 March. Last year, I was in Redang during Earth Hour and it was good to see many resorts at Pasir Panjang switching off their non-essential lights in support of this. Let's hope they do it again this year. The point is not how much CO2 emissions we can reduce in that one hour but more importantly, the reminder that each of us has a part to play in protecting the environment. Awareness is nothing if it is not accompanied by action. So it begins with a small step, a small action on our part to turn out our lights. Hopefully, that leads to bigger steps and bigger actions that eventually change our inner attitudes and transform our outward actions and behaviour. I had a	first hand account of such an environmentally-conscious society when the family and I were holidaying in South Korea in December last year. We noticed few rubbish bins and were informed by our local guide that folks often brought home their rubbish to recycle. I was impressed to see food stall owners making the extra effort to remove unsorted rubbish which ignorant (or irresponsible) tourists had dumped into bins after eating, then sorting and disposing into the appropriate bins for paper, cans, plastics and other waste. When it is the norm for nations of people to behave in an environmentally-conscious fashion, Earth Hour would have accomplished its true goal. Orca at San Diego Seaworld. 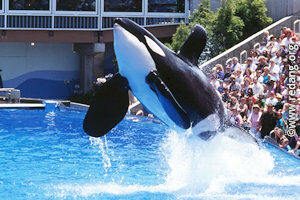 It was sad to read of the recent tragedy at Seaworld when an experienced trainer was killed by an orca (killer whale). While I have watched and been entertained by performing orcas, I have mixed feelings about training what are instinctively wild, highly intelligent animals in captivity to perform in front of crowds. It's bad enough that these orcas, used to swimming freely across hundreds of miles of ocean, are kept in small spaces. It's also unnatural to have them perform for food instead of hunting and catching prey. We have not sufficiently understood how captivity and training methods affect wild animals and what triggers certain aggressive behaviours. The more intelligent the creature, the more complex their psychology. Coupled with the fact that these are wild by nature means they can be unpredictable at times. Not surprisingly this is not the first nor will it be the last fatal incident involving large 'trained' wild animals. For those of you interested in underwater photography, you may want to check out Scott Geitler's Underwater Photography Guide site. This great resource contains a complete online underwater photography tutorial and class for beginners and advanced photographers. I found out about it from Scott himself, who dropped me an email after visiting this site. 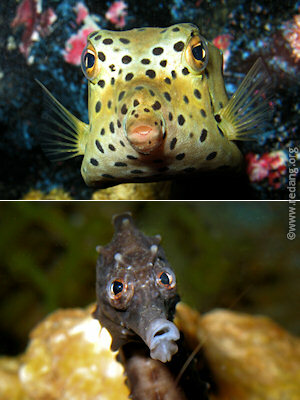 Not surprisingly, Anilao and Lembeh are two of his favourite dive destinations too. Sometime ago, Nathan of Jellyfish Facts website [weblink removed by request from author] also wrote to inform me of his site. It's a site dedicated to jellyfish and has lots of information for jelly enthusiasts. For those who love nature and wish to discover more of Malaysia's rainforests, islands and wildlife, check out Rick Gregory's Nature Escapes from KL. It's quite a comprehensive one-stop site that covers all of the interesting nature sights and destinations around KL and Malaysia. Rick wrote to inform me of his site last year and he's added quite a bit more information since.